What is the language of instruction at BSL? All courses at BSL are given in English. What are the requirements to be accepted in the Diploma in Sustainable Business? Please check our Admissions criteria and checklist section. What degree will I obtain with the Diploma in Sustainable Business program? Upon successful completion of the program, you will obtain a Diploma of Advanced Studies (DAS) in Sustainable Business – a fully recognized degree by BSL. Do you require work experience for the Diploma in Sustainable Business program? Applicants must have at least 5 years of pre- or post-master’s relevant work experience. What TOEFL score do I need to apply at BSL? As part of the selection process, successful applicants are interviewed to assess their level of English and their chances of success in the particular program. As a guide, you will need a level of English as follows: IELTS 6.5; TOEFL 90; TOEIC 800 or equivalent (one test required only) The BSL TOEFL code is 0018. Do I need to take the GMAT to enter the Diploma in Sustainable Business program? GMAT score is not required for your application for the program. Why do other universities ask for the GRE or the GMAT and BSL does not? These two exams are often required to enter graduate studies in the USA. Graduate studies is studies for the Master’s degree or higher. American universities have agreed on these standard exams in order to screen out applicants who do not respond to these standards, and this is exactly where BSL diverges. You can apply to BSL without the GRE or the GMAT. Besides standards on which many schools insist for their admission, there are two other reasons why BSL does not require these exams, namely because high exam results does not predict who will become excellent business managers, and because at an international school such as BSL, an international standardized exam will not offer a fair chance to all applicants from around the world. BSL offers scholarship to worthy candidates for its full-time programs only. The Diploma of Sustainable Business is considered part-time. Does the Diploma in Sustainable Business program include an internship? The program does not offer an internship, but it includes a compulsory 10-month consulting project with a company. Learn more about the consulting projects. Does BSL offer help to the students to find a job? Yes, at BSL, a staff member is at the school especially to support students in their career orientation. BSL cannot “give” a job to students or graduates from BSL, but the school’s staff members do help all students in developing their career interests and contacts (professional networking). Also, it is important to note that BSL is in Western Switzerland, and that this region of the country is unique in the world because it is home to an extremely high density of multi-national companies, international businesses, international financial services, international organizations, NGOs, professional associations, as well as humanitarian and charity organisations. All of these attract numerous small and large suppliers, consultants and commercial agents who all have interests in these larger organizations and multinational corporations as stakeholders or as partners. Studying in Western Switzerland is therefore a smart decision if you also want to develop your professional network. BSL staff work hard with industry leaders and professors to continuously develop all these contacts so students can benefit from them. Does BSL offer any online courses? BSL does not have online courses for the simple reason that learning and practicing management must be learned with other people together in groups and in classes. It can best be learned with the guidance of teachers who themselves work in business. Such “live” practice is not possible online. What is the meaning of ‘accreditation’? Institutional and program accreditations ensure that a school and its programs offer a high quality level of education. Only 10% of business schools are accredited (have undergone the rigorous accreditation process). BSL was the first business school in Europe to achieve full ACBSP accreditation for all of its programs in 1996. Institutional accreditations such as AACSP and EQUIS validate the viability of a school, whereas, program accreditations, such as AMBA (only for MBA programs) and ACBSP (for all business programs including the doctorate level) validate the continuous high quality of the programs delivered. For more information on BSL’s accreditation, see Rankings and Accreditations. Are the diplomas of BSL recognized? The ACBSP accreditation ensures that BSL degrees are recognized and valued world‐wide. With the launch of the Bologna reform in Europe, universities rely increasingly on the ENIC-NARIC system to verify degrees of other universities. Currently, BSL is listed in the U.S. NARIC system through CHEA (Council of Higher Education Accreditation), thus providing recognition of its degrees to European universities where our students may want to continue their education. CHEA is among the three official bodies in the United States that are entitled to list accredited institutions of higher education. See more information at Rankings and Accreditations. Why is BSL not on the Swiss ENIC list? The Swiss ENIC system currently lists only Swiss state‐owned universities and cannot list private institutions such as IMD or BSL. Please note that both IMD and BSL are listed in the U.S. NARIC system. BSL is listed in the U.S. NARIC system through CHEA providing the recognition of its degrees to any admission officer of universities across Europe where our students may want to study. In the United States, three bodies are officially entitled to list accredited institutions of higher learning, among them CHEA (Council of Higher Education Accreditation). The Bologna reform regulates university collaborations across Europe with a unified ECTS credit transfer system. It has placed new demands on the ENIC‐NARIC system as university Admission Officers can face difficulty in correctly evaluating the pertinence of various degrees in student application files. An example: current limitations of the system include that private institutions in Switzerland are not considered by ENIC Switzerland (part of the Swiss Rectors’ Conference of Swiss Universities (CRUS), a state‐managed institution. Top tier private institutions such as IMD and BSL are as a result not included in the European / Swiss ENIC table of recognized universities with the result that some Swiss state universities do not recognize BSL degrees. However, BSL’s diplomas are included in the U.S. NARIC list, and this ensures recognition of BSL degrees within the larger ENIC-NARIC network by all universities and governments that also recognize degrees from American universities (all universities in English-speaking countries, all universities that recognize American degrees from international universities anywhere in the world). What are the estimated living expenses in Lausanne? 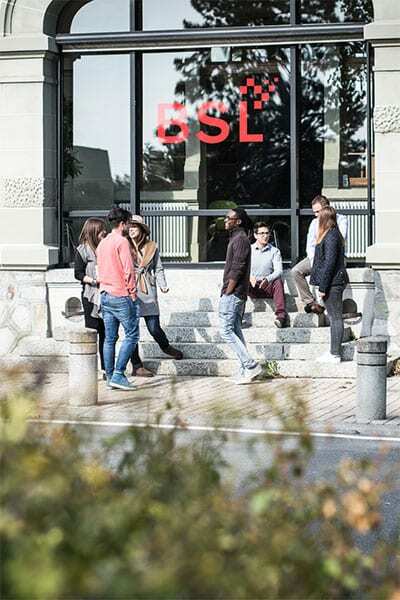 BSL advises students to budget a minimum of CHF 2500 per month for expenses related to food, accommodation, local travel/commuting, school textbooks, social/entertainment, and medical insurance. Please note that every student in Switzerland must be insured by a medical and accident insurance company in Switzerland, even if you already have an international travel insurance. (BSL can help you find an insurance company if you do not already have insurance in Switzerland). Do I need a visa to study in Switzerland? Please refer to visa requirements page for the Diploma in Sustainable Business program. How do I reach BSL by public transportation? You can reach the school by Metro (line M1) or Train. See our address and detailed map with directions.